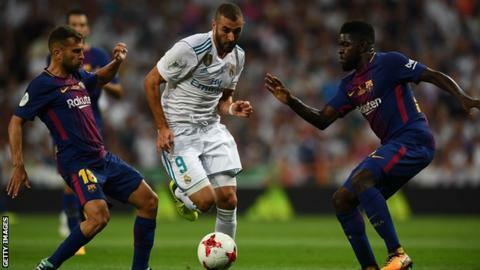 Real Madrid striker Karim Benzema has signed a four-year contract extension that ties him to the club until 2021. The 29-year-old has scored 181 goals in 371 appearances since joining from French side Lyon in 2009. He becomes the fourth Real player, after right-back Dani Carvajal, left-back Marcelo and midfielder Isco, to agree a new deal this week. Manager Zinedine Zidane has also signed a new contract with last season's Champions League and La Liga winners. Benzema has won 14 trophies at Real, including three Champions League titles and La Liga twice. The France forward has won 81 caps but has not played for his country since he was placed under formal investigation in 2015 over an alleged bid to blackmail one-time international team-mate Mathieu Valbuena.